Select Laser Engravable Products Laser Rubber, 8 1/2" x 11" Low Odor Laser Rubber, 8 1/4" x 11 3/4" Buna-N Laser Rubber, 8 1/2" x 11" Standard Laser Polymer, 7 1/2" x 11" Art Stamp Laser Polymer, 7 1/2" x 11"
Our pre-vulcanized Laser Rubber is available in 8 1/2" x 11" sheets. Pinkish-red color. Burns cleanly leaving a white ash residue. Good for general stamping applications or self-inking stamps with regular stamp inks. This is our lowest cost material. In production it has an odor that may be offensive to some people. Our Low Odor Laser Rubber is offered in sheets measuring 8 1/4" x 11 3/4" (A4). Grey color. It has the same engraving characteristics as the standard laser rubber but is not as odoriferous, engraving with very little to no odor. 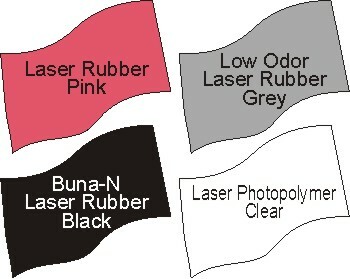 Buna-N Laser Rubber is a black, synthetic material used to form stamp or printing dies that will be used with alcohol, acid or oil based inks. 8 1/2" x 11" sheet size. It is not necessary to use Buna-N Rubber for most stamp production -- only industrial use stamps require Buna-N. Engraves with a strong odor. Our Standard Laser Polymer is supplied in 7 1/2" x 11" sheets. Clear color. Laser Polymer burns with very little odor. Great for general stamping applications and self-inking stamps. The cost is higher, but the engraving speed is also faster making it very economical regarding burn time. 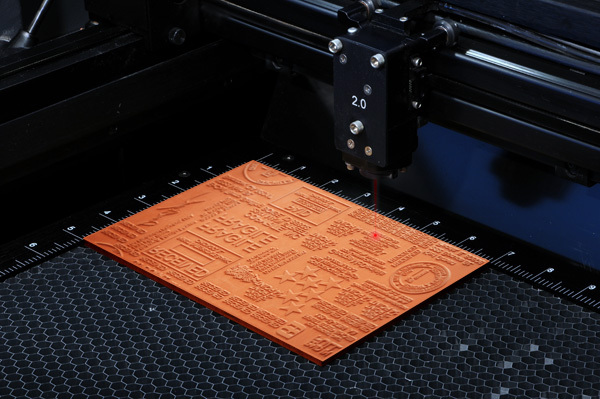 Art Stamp Laser Polymer engraves like Standard Laser Polymer, but this material is crystal clear and the substrate backing is removable to allow the user to attach the die to an acrylic block for printing. Approximate sheet size is 7 1/2” x 11”. All of these materials need to be washed with soap and water after engraving. 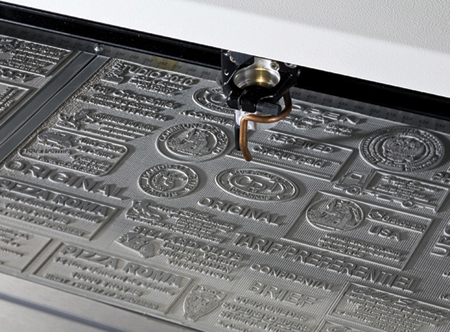 Make sure your laser equipment is suitable for engraving stamp dies. 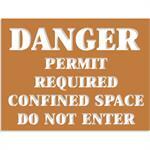 Check with your laser equipment manufacturer to determine compatability of equipment and software. • Laser engraving or cutting rubber or polymer can possibly ignite the material. Never leave the laser system running unattended for any reason. • Laser engraving or cutting rubber or polymer can produce foul odors, although engraving low odor rubber or polymer is much less odoriferous. You may need to particulate filter or odor filter your exhaust depending on your environment, installation location and local air quality control regulations. 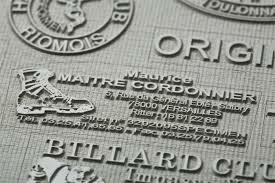 • Laser engraving or cutting rubber or polymer can produce abrasive dust and smoke. You will need to clean your laser more frequently to reduce wear and tear and keep the optics clear. • Laser Rubber can be engraved on either side. • When vector cutting this material be sure to use a vented cutting table. Without a cutting table the likelihood of flame increases. • After engraving, wash the material with soap and water. Then rinse and towel dry. • The Laser Polymer has two sides. One side has a slick “substrate” hard plastic coating, the other side has a thin plastic coating. Pull off the thin plastic for engraving. • When vector cutting this material be sure to use a vented cutting table. Without a cutting table you will melt the polymer. • After engraving, immediately wash the material with soap and water (if you wait, it will be more difficult to wash off). Then rinse and towel dry. If the plate is sticky after washing, you can apply a thin layer of mica powder. The Most Popular Self-Inking Stamps Worldwide! Wash ash and other residue from your laser engraved rubber or polymer die material. Ideal for cutting rubber or polymer dies. Use your laser to cut perfect stencils!